There's an ancient and (from all appearances) abandoned German cemetery at the southeast corner of Rand Road and Golf Road in Des Plaines, just northwest of Chicago. I passed it on my walk yesterday, and took ten minutes to walk the rows and look for any familiar names. I didn't see any names from my own family tree, but it was interesting nonetheless. Of the 80-ish graves I saw (and it looks like many have long since been removed) at least half were of people who died in the 19th century, though one man was buried there as late as 1975. Many markers are broken or mostly buried, and there is one foundation for a now-gone mausoleum. A little Googling showed it to belong to Immanuel Lutheran Church, on Lee Street in downtown Des Plaines, but there is no sign on site to that effect, and there is no fence nor much evidence of any care save the occasional mowing of weeds. I did find a page with a summary of readable markers. For you geofreaks, it's located at 42� 3'9.79"N 87�53'40.49"W.
After an insane amount of time wasted screwing with the drivers, configuration, and application setup, I finally got LightScribe to work on one of my Dell SX270 XP machines. I have yet to get it to work on any Win2K machine, and I've begun to wonder if there's something in LightScribe that (intentionally or not) simply doesn't play well with 2000. However, once I burned a few LightScribe labels, I must say that I don't recommend it, even on XP. The contrast is very poor, and if the text is small enough to express titles for 20 songs, it's virtually unreadable. Don't bother. One of my favorite hymn tunes is Gustav Holst's Thaxted (named after the town in England where he grew up) which most people recognize as the great anthem around which Holst built the Jupiter movement of The Planets. Anglophiles may also know the tune as that of the WWI-era patriotic hymn "I Vow to Thee, My Country." The Wikipedia writeup indicates that it has a meter of 13 13 13 13 13 13, which is extremely uncommon and may be unique among Christian hymns. Is that why it still gives me chills after hearing it literally hundreds of times? Why are we moved by some tunes (absent words to carry emotional content) and not others? Saw something today (at Trader Joe's) I'd never seen nor heard of before: The pluot. Quarter plum, three quarters apricot. They look like plums, but were not for sale individually and I didn't want to buy a whole package without knowing a little bit more about what they were. I like both plums and apricots, though; how can I lose? George Ewing's review of the first Carl & Jerry books is now on the stands in CQ Magazine, page 35. Although we still don't know much about John T. Frye, a chap who used to live in Logansport, Indiana wrote this afternoon to tell me that John's younger brother Bailey WA9OWH is still alive and still living in Logansport. I'm hoping to contact him in the next few days to see if he can provide any additional details. John T. Frye himself died in 1985. September 27, 2007: What's On the Other Side of That Record? While in the car the other day, I heard the slightly jazzy old torch song "That Old Devil Moon" on the radioand the announcer said it was from the musical Finian's Rainbow. It caught me up short: That was in Finian's Rainbow? Huh. Didn't know that. Now, I thought I knew all the songs from Finian's Rainbow; in fact, I could sing them if you wanted to be tormented, especially "That Great Come-And-Get-It Day," one of musical theater's supreme comic moments. But "That Old Devil Moon" got away from me. So when I came home, I looked up the score of Finian's Rainbow online. And then I realized that I didn't know half the songs from Finian's Rainbow. Really. Literally. Half the songs were missing from my remembrance. Here's why: Back in high school when I first met Carol, we would often sit in her living room in the evening and talk while records played on her father's expensive Scott stereo system. Carol would drop a stack of LPs on the changer and basically forget about them. The changer could take a decent stack, and for the few hours we had together (we were both early-to-bed types) that was more than enough. Except that we never flipped them over and listened to the other sides. So it was with Finian's Rainbow and all the other records in her collection. We listened to Side 1. We never got around to Side 2. And guess which side of the Finian's Rainbow soundtrack "That Old Devil Moon" was on? There was a saying current among Boomers in our youth, hurled at people who were harping to excess on a single point: "Hey man, what's on the other side of that record?" It's passed out of our culture, for the obvious reason: Records now have only one side. (I flash on the punchline from Arthur C. Clarke's classic 1949 short, "The Wall of Darkness".) If you hear any of Finian's Rainbow, today, you hear all of it. Carol and I spent some time with Gretchen and Bill and Katie Beth last night, and while making funny noises at my only niece (now ten months old) I found myself asking her in my mind: Little girl, will you ever understand half of what your parents lived through? And can we even begin to imagine what you'll see when you're 90, in the year 2096? I've been holding back on revising my 2004 book Jeff Duntemann's Wi-Fi Guide for almost two years now, hoping for finalization of the IEEE 802.11n spec. It seems like we've had "Draft-N" products piled up in Best Buy since the glaciers retreated, and yet the specification seems no closer to its final form than it was when Zoser invented the pyramid. Admittedly, it's a spec with sky-high aspirations, but the real problem now seems to be a recalcitrant Australian research consortium called CSIRO, which may or may not own patents that may or may not completely prevent the IEEE from nailing the spec before the glaciers come back. Wireless-G works very well for what 80% of people do with it. G runs faster than any broadband connection I've ever seen, and Internet distribution is most of what Wi-Fi does. We are getting close to wireless saturation on 2.4 GHz. I recently popped my laptop open and did some warsitting. Without moving a wavelength, I saw four APs named "linksys," all operating on channel 6. (Those are the default SSID/channels for most Linksys Wi-Fi routers.) No matter what else it is, Wireless-N is a spectrum hog, and there will be RF fistfights galore when this thing hits the airwaves. Wireless-N has been touted as the solution to in-house HD video streaming, but with all those other APs within close range, I've got my doubts. Whereas you were a lonely Wi-Fi geek trendsetter at one time, those days are gone. Your neighbors all have APs now. (And all of them are named "linksys"!) Drop one or two nearby 2.4 GHz cordless phones into the mix, and watch your throughput plunge. No matter what the IEEE does, there's strong possibility that today's Draft-N hardware will be unable to work at full functionality with tomorrow's Wireless-N gear. It's not an easy spec to pull off, and small differences may pile up against you in subtle ways. Finally, if CSIRO prevails, Wireless-N gear will never get very cheap. I recently fixed a Wi-Fi problem for Carol's sister...by dumping Wi-Fi. An intermittent and unidentified analog source on 2.4 GHz (which smelled to me like a neighbor's cordless phone) was forcing her connection to drop, so I went down to Best Buy and grabbed a pair of Linksys Powerline networking bricks, and the problem went and stayed away. Ironically, one of the things I have to add to the next edition of my book is how to determine when it's time to just give up on Wi-Fi and use another technology. Powerline works extremely well, and if all you're doing with Wi-Fi is hooking one or more desktops to a router elsewhere in your house, Wi-Fi is in many respects the least desirable way to do it. "Net rot" is real, and it can happen irrespective of anything you do with your own network. So I'll be adding a chapter on Powerline technology as an adjunct or even a swap-out for Wi-Fi. And I will still be counseling against Draft-N. Wi-Fi is rapidly becoming the victim of its own overwhelming success. The Make Blog recently aggregated a very nice FM Crystal Radio. A diode can detect a strong FM signal via slope detection, and by "strong" we may mean "within a mile or two of the broadcasting antenna." I grew up a couple of miles from WJJD-AM just outside Chicago, and was looking right down the throat of its 50,000 watt directive array. Not only would a crystal radio receive it, WJJD was all that any of my crystal radios would receive, and receive so well that they drove a small speaker that could be heard clear across my bedroom. I intuit that an FM crystal set would work best with a Schottky or microwave diode having a low forward voltage, and (having a drawer full of same) if time ever allows I'll attempt one. A silver-plated tank coil would help too, perhapsQ matters! Slashdot reported that IBM is about to release a derivative of Open Office under the name...Lotus Symphony! That, my friends, is trademark recycling with a vengeance. From Denis Ryan I got a pointer to Favicon from Pics, a neat Web-based utility that takes an image and crunches it into a favicon for you. The site produced the favicon that you can now see on my Copperwood Press page. The little graphic isn't perfect, but neither did it take any work to create. Fair use exceptions to copyright law help the economy more than copyright itself, according to this study. Thanks to Bill Meyer for the pointer. Do not miss The Museum of Unworkable Devices. Learn how most of the popular perpetual motion machines don't work. My favorite quote from the article: "Be skeptical of any cyclic perpetual-motion proposal that can be operated equally well in either direction." Thanks; I may be skeptical about some of the others, too. Arrr(gh), Matey! It's International Talk Like a Pirate Day, and (as little love for pirates as I havedon't get me started about vampires and zombies!) I may as well get with the program, and talk some pirate about my current hell-bent object of research, ebooks. Even books like ours that have never been released as ebooks show upas ebookson various pirate sites and Usenet. Some of these are shabby OCR jobs, and many are simply stitched-together page images, but a few of them are so well done I would be compelled to say "Nice job, you scurvy dog!" while hanging their perpetrators from the nearest yardarm. The more popular a book is, the more likely it is to be pirated, and the more pirated copies will be knocking around online at any given time. The curve is seriously nonlinear, though there are always anomalies. In general, you have to be pretty popular to be pirated at all, and hugely popular to be pirated a lot. These pirated ebook editions are sometimes claimed to be "authorized" and sold on Web sites. Keith and I have sent any number of "cut that out!" notices to such Web sites. Interestingly, the pirates often honor such noticesthough new sites pop up periodically and have to be dealt with. Usenet is one of the biggest single sources of pirated ebooks (as well as music, software, and movies) and yet almost nobody ever talks about Usenet, which is the IP equivalent of the Caribbean Sea in 1740. Most authors and publishers worry too much about piracy. There's a sort of "don't flatter yourself" moment that comes of looking for your own work among the pirates, at least if you're not Neil Gaiman. I think it was Tim O'Reilly who said that "Your enemy isn't piracy. Your enemy is obscurity." My enemy certainly is, sigh. Even popular authors lose less money to piracy than conventional wisdom suggests. My reasoning is this: By the time you become popular enough for the pirates to bother with, you've already made the bulk of your money. The way to minimize ebook piracy is pretty obvious to me: Make your titles cheap and make them easy to buy. Don't train your readers and fans to be pirates. Case in point: I went looking for an authorized ebook edition of Lord of the Rings last year and didn't find one. Some discussion I saw online suggested that Christopher Tolkien was having nothing to do with ebooks. Immediately following were speculations that downloading pirate ebook editions of print books was one way of backing up the paper copies that you already own, and thus protected activity under Fair Use. This may or may not be true, but...why encourage readers to get comfortable with that dicey calculus? X% are willing to give you money. Y% will invariably rip you off, no matter what you do. Why not settle for X% of the pie? Turn it down, and you get no pie at all. Worse, you'll then be forcing customers to decide whether to be honest or not, and if you make it impossible for them to be honest, many or most will take the path of least resistance, and before you know it you're looking at another eyepatch and another parrot. Oh, and don't bother with DRM. Polly is a cracker. September 17, 2007: A Flipflop on "Eyeability"
Traveling again. And while I did throw some dead trees in a box to take along, I've been doing almost all of my reading on two devices: My Thinkpad X41 Tablet, and my Sony Reader. The idea is primarily to see if the e-ink display in the Sony Reader really is easier on the eyes than a conventional LCD laptop display. What I've discovered surprised me a little, and has contradicted something I've been saying for ten or twelve years now: That displays operating by generated light are harder on the eyes than displays operating by reflected light. If it's true, it's not as true as I originally thought it was. I've done a lot of ebook reading on my X41. I read the ebook version of Chris Gerrib's debut SF novel The Mars Run on it, while sitting in the corner of a poorly lit RV. More significantly, I read Colin Wilson's superb The Criminal History of Mankind on itand that's a big book, I'm guessing close to 250,000 words. In neither case did I notice my eyes getting any grittier any faster than they generally do reading from paper. I bought the Sony Reader more recently and thus have less data, although (as I mentioned a few days ago) I found out early that the gadget is something less than a blinding flash and a deafening report. Still, The Skylark of Space went past the eyeballs on the Reader without any serious trouble assuming I had enough light to read by. Eye, (sorry) there's the rub. The Sony's e-ink display is truly a lot like regular paper: You can't read it in the dark. Take it under the covers, and you need a flashlight. And having done a lot of holding it up against various types of books and magazines in various qualities of light, I will go further: It takes better light to read from e-ink than it does to read from any sort of printed paper except newsprint. So I stand corrected: There may be less here than meets the eye. One of the advantages of a laptop/tablet display is that it presents a relatively constant light level to your eyes. Paper and e-ink depend on incident light, and readability is affected by the angle at which light hits it. E-ink displays are inherently wider-angle than LCDs, but this advantage is counteracted by the need to position an e-ink display optimally with respect to the light, rather than with respect to your eyes. Book people do this without thinking, but I've also found that having read a couple million words on it, I position the X41 optimally with respect to my eyes now as well, just as automatically. E-ink will get better over time, and at some point it will not only equal high-quality printed paper in terms of contrast, but also in resolution and levels of grayscale and perhaps even color. (Right now, e-ink is hopeless for illustrations.) In the meantime, I'm realizing that the Thinkpad X41 has been an extremely good ebook reader, and it doubles as a laptop, heh. I'm about to get pretty busy and may not post for a bit. In the meantime, while furiously researching ebook readers and distributor sites (as you can probably tell from my recent posts) I happened upon Feedbooks, a French site serving up free ebooks formatted specifically for the Sony Reader and the IRex Iliad. In browsing their collection I realized that a lot of E. E. "Doc" Smith's and H. Beam Piper's work is hosted on Project Gutenberg, and therefore (reasonably) reliably in the public domain. I took a few minutes to research it, and found no copyright renewal records for any of the Skylark books, and only one of the Lensman books (Gray Lensman). Piper's Little Fuzzy appears to be out of copyright, as are Space Viking and a lot of his other works. My copies of Skylark and Lensman are from the 60s and falling to pieces, so it'll be interesting to attempt them on the Sony. There's a certain delightful verve and gusto in the Skylark books, particularly, and I like verve and gusto. (Angst and anguish are not my thang, for the most part.) You have to factor the book's age into the matter, as well as the culture in which and for which it was created. Some parts of The Skylark of Space were written as early as 1915 (!!) and the amazing thing is not how dated the book seems, but how well it actually holds up. I had hoped to have a free ebook version of "Guardian" to turn loose by now, but real life has intervened. Give me another week or so. It's most of the way there. After that I will release a free version of "Inevitability Sphere," especially if I can concoct a cover image of a huge black sphere up among fluffy white cumulus clouds. 3-D art is not my strong suit, but perhaps it's time I learned. I'm in the process of processing several of my short SF stories for release as free downloads, and in doing so I've been reviewing the Creative Commons licensing scheme. CC is an effort to add some richness to our ancient and somewhat blunt-instrumentish copyright laws, in order to allow creative people to grant some rights to their works without having to grant all rights, or else no rights. The CC license is granular, with a grid of grantable rights and restrictions that may be selected in various combinations by the creator/rightsholder. The CC licensing scheme is a little more complex for music than for written works, and in this posting (not being in the music biz) I'll restrict my comments to the realm of text and images. The work is distributed as I released it, without modification. There's more to it than that, and if you're a writer, illustrator, or photgrapher, I encourage you to read up on it. My point today is this: In reading over the Creative Commons site, it occurred to me that there is no provision for granting or retaining fanfic rights under CC. I suspect that this is simply because fanfic (while ancient in some respects) has gotten big only recently. Many huge fights have been fought (and are being fought) over fanfic. An unambiguous legal vehicle allowing the selective granting of fanfic rights would be a very good thing to have. This is being done. Paramount has for years granted a sort of non-commercial fanfic license to the Star Trek characters, designs, and trademarks. I recently saw an episode of Star Trek: The New Voyages that was a low-budget but pretty effective fan remake of my favorite Trek episode ever, "The Doomsday Machine." (It was retitled "In Harm's Way.") This was done with Paramount's blessing, under the proviso that no profit was to be taken from the effort, and the produced material would be given away rather than sold. Fanfic is permitted with attribution of the original work and author. Fanfic is permitted as long as the works are given away rather than sold. Fanfic is permitted with the approval of each fanfic work by the rightsholder. The first two should be obvious. The third component allows rightsholders to exclude fanfic that is crude, obscene or in some other way harms the reputation of the original work, and perhaps fanfic that (even within the spirit of the original work) overlaps or contradicts characters, situations or story arcs that the rightsholder would like to "keep clean" as they were createdor intends to pursue him/herself in the future. The third license implies some sort of "approved by the rightsholder" bug to be placed in the distributed copy of a fanfic work. Charlie Stross has said emphatically that "Your fans are not the enemy." It's obvious to me that fanfic is a great way for authors to broaden the reach of their works, and authors should have a framework to make fanfic possible legally, to the degree that they choose to support it. I am not anything like a lawyer, but there are lawyers who have worked on the Creative Commons licenses, and I hope that eventually they work out something within CC to make fanfic legally and unambiguously supportable. Amazon is creating a new site called Askville, which is an ask-questions-get-an-answer social networking system. Answers are rated by users, and you earn Quest Coins by providing good answersand lose them by posting bad ones. It's a little unclear what Quest Coins will be good for yet, because Questville.com (another Amazon startup, possibly Flash-powered) hasn't gone live yet. The key point here is not that Askville exists (it's nothing special that hasn't been done before) but that Amazon created it from scratch rather than bought it. This idea may sound retro and completely loopy, but what the hell: To capture nontechnical readers during the critical next five years of the ebook industry's evolution, smart publishers might well OEM a cheap portless, dirt-simple, SD-card capable e-ink reader from the Pacific Rim, fill it with some (large) number of books from the backlist, and then sell either/both the midlist and frontist on additional bubble-packed read-only SD cards in retail stores, say, quarterly. Small SD cards (64 MB -128 MB are now dirt cheap and could easily hold a middling publisher's entire semiannual frontlist. Baen Books has been working on a private-labeled ebook reader, but I'm really envisioning something not Internet-connected at all, targeted at audiences who may just prefer to buy something physical at Borders periodically than fool with a poorly designed or simply idiotic Web system. (I won't name names, but you know that they exist.) This would be a tougher call for monster NY publishers who publish in many different areas, but for successful genre publishers (romances, mysteries, SF, etc.) it could work, and work well. If the reader has no ports and the cards require a reader to read them, even the IP paranoids might say yes. I bought a Sony Reader a couple of weeks ago, and it sat in a box while I cleared my plate on returning from Chicago. I've had some time to play with it now, and at this point I don't recommend it. I had to buy itI'm a publisher trying to break into the ebook business, and I need the hands-on, which (for me at least) is deductablebut if you're hanging in there waiting for the right time to jump into the ebook reader market, you might wait a little longer. The Sony Connect software (basically a USB driver and a minimalist library manager) will not install under Windows 2000! It just pops up a box complaining that "Connect Reader by Sony requires that your computer is running Windows XP." It is to boggle. Perhaps unfairly, I began to Wonder What They're Up To. After all, this is the company that originated the consumer rootkit. However, further research suggests it's just ordinary stupidity. I may try the third-party libprs500 app, and will report here when I do. The page-navigation buttons are on the wrong side. I think most people would expect them on the right margin of the device. They're on the left. Furthermore, there are two sets of navigation controlsboth on the left. This may be a consequence of the Japanese languagein Japan, books are read from right to left. Not sure. But it make page turning more awkward than it should be. Left-handed people may like it that way, though. There's no hierarchical management of storage on the SD card slot. Because I couldn't get Connect to install, I tested the Reader by loading a bunch of ebooks onto a nice new 2 GB SD card. I wanted to have Baen books in one directory, computer books in another, etc. No dice. The world is flatand so is the external file management. PDF rendering is terribleand I don't see why it needs to be. Somebody at Sony tried to cut corners licensing somebody's PDF renderer, and it shows. It's a Sony. Go read the history of Sony vis-a-vis technology standards. Need I say more? This isn't really an end-user problem, but Sony did not make it easy for publishers to create content in their proprietary BBeB format. (LRF/LRX files.) Google Code, of all places, recently published a utility called BBeB Binder, which is a free converter for crunching HTML files and text files into BBeB ebooks. Testing this is on my list, but I haven't gotten to it yet. MS had the right idea by creating a free plug-in for Word that saves a Word .DOC file into a .LIT file. WordRMR just works. Sony needs something like that. Haven't seen it yet. If the Reader is to have a future, they're going to have to get busy. September 6, 2007: Is the Kindle Kindling? Mike Reith reminded me of something I had almost forgotten: Last fall Amazon announced (or leaked, as they preferred to spin it) the existence of a hardware ebook reader called the Kindle. Photos appeared in Engadget, and then it mostly dropped off the edge of the Earth. It doesn't get high marks for looks, but consider who's creating it, and what's in it: The formidable MobiPocket Reader, which is perhaps the best ebook reader app that I've tested so far. Amazon now owns Mobi (which I had also forgotten) and from what little factual information I've been able to glean, their intent is to do for ebooks something like what Apple did for individual music tracks, and I'm very sure that no firm on Earth is in a better position to do that. So. Where the hell is the Kindle? The NYT article Mike pointed me to suggests that Kindle will appear in October. Interesting, considering how little we know about it. The photos suggests an e-ink display, and in fact if it isn't e-ink, the device is DOA. There's an intriguing hint that the Kindle will have built-in EVDO, which would be stunning if EVDO didn't cost $75-$90/month and were available everywhere, which it isn't. The device shown in the photos has a prototypish look about it. Hardware is easier than software, but hardware isn't easy. It may simply have taken more time to get the kinks out of it than they expected. Focus groups were convened late, and hated it. Most of the comments I've seen online say it's too big, and has too many buttons, including that Blackberry-style keyboard. The keyboard, by the way, suggests more uses than ebooks, none of which have been made public. There have been some hints that the device will cost as little as $50 with a contract bundling EVDO service and some kind of subscription to an Amazon ebook store. This is a business model worth trying, and if it can work at all, Amazon can make it work. In the meantime, Palm withdrew its forthcoming Foleo UMPC mini-laptop, which I had heard about from David Beers. The Foleo was basically a tiny laptop that talks through your cellphone, and had some potential as an ebook reader, especially considering that it did all the other stuff that road warriors need to do. It's possible that the Kindle may occupy part of this space. We don't know yet. And while we're on the topic, the new e-ink version of the Bookeen Cybook is supposed to be released in October, at about $350. 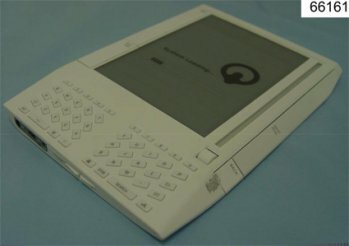 The unit is very similar to the Sony Reader, except it uses the newest update in the e-ink display technology and displays MobiPocket. Ohand I just bought a Sony Reader. Alas, the first thing I learned about it is that its USB link software refuses to install under Windows 2000! (The error box says "Connect Reader by Sony requires that the computer is running Windows XP.") At least Sony is still the Sony we've long learned to love and (eventually) leave. Maybe I shoulda bought an IRex. More later. September 4, 2007: Paper Piracy? I got a note from a chap at a major NY publisher who's been reading Contra for some time and has a special interest in new business models, particular those that allow the reduction of retail returns. He thinks the notion of "just-in-time" bookstore replenishment will happen someday, but it will be capital-intensive and slow to implement. (Just one book manufacturing machine won't make it. To be effective, a big urban store would need five or six and eventually more.) His firm would love to have their backlist out of their warehouses and onto a hard drive on a server, but they're worried about something I hadn't thought about: Counterfeiting of paper books. He isn't sure how much to worry about this (and I'm not worried at all, especially for my own work) but there are people at the large houses who do nothing but worry about IP issues. Here's the scenario: TeraHouse Publishing transmits a print image (almost always a PDF) of a book that has gone from frontlist to backlist over to a POD manufacturing server somewhere. The initial print run has been sold, and it will not be reprinted conventionally. TeraHouse intends to harvest the book's Long Tail by manufacturing either extremely small quantities (under 25 at a time, as Lightning Source does) for a "shelf cache," or as the technology matures, onesies. The danger lies in having the print image files get out on the Net somehow. Anyone who claims that this can't be done needs to be kept away from computers. A print image for an all-text novel or nonfiction title isn't very large. The print image for my republished Old Catholic history book The New Reformation is 2.2 MB in size, including the cover. That's smaller than most MP3s. A full-color cover image would be larger, but not larger enough to matter. A USB port and thumb drive is all you need, at any point in the pipe. So far it's business as usual: Print images have been sent over the Net to print houses for years. The danger comes when you're sending the print image to not one place but to lots of places, like rooms full of POD machines in hundreds of bookstores. The more joints in the piping, the more you need to worry about leaks. If the only place you send the file is to your print house, you know who to blame if the print image shows up on BitTorrent or Usenet. If you have to send it to a thousand places, forget it. Far fetched? Seems so to me. I asked him if he had ever heard of this happening, and he said, "Can't talk about that." Heh. Sounds like somebody, somewhere got burned a little. I'd worry more about people just passing the PDFs aroundand then loading them temporarily on Lulu as private projects, printing single copies for themselves, and then deleting them. That would be very difficult to police. Interestingly, he hadn't thought of that, and I so I guess I gave the poor guy still one more thing to worry about. Future generations of POD book machines may have technology to imprint a machine-unique code on each manufactured copy. Color copiers do that now to make it easier for the Feds to trace counterfeited money. And if you're a publisher, books are money. It'll be interesting to see how things work out over the next ten years or so. I haven't reviewed any new wines lately because we've been traveling so much (albeit only to and from Chicago) that we just haven't tried many. But yesterday we ate dinner alfresco on the back deck, and tried a chilled mild (5.5% alcohol) Italian rosé from Bartenura Vineyards. It's the first Malvasia I've ever had, and Carol and I (and our friends David and Terry) were stunned at how good it is. First of all, it's a summer wine, and while the vineyard calls it semi-sweet, it's sweeter than most wines I place in that category, though half a notch drier than what I would call a true dessert wine. The label calls it a red, though to me it's a rosé, albeit a dark rosé. Strong fruit, redolent of cherries. Very light effervescence, of a degree that you can feel but can't see in the glass. It's a little too sweet to go with a non-spicy main course, and might be better with dessert or (in non-dinner circumstances) with bread and sharp cheese. I could see it going well with something spicy, especially if you have no ideological objection to sweeter wines. Pizza? Quesadillas? The world is flat, heh. Give it a shot. Near $10, and fairly widely distributed. You may not see it in the Italian section of your wine shop because it tends to get exiled to the dessert wine section. Do ask. It's worth the extra trouble to find. The Science Fiction Writers of America (SFWA) has walked into a trap, a trap that they should have seen coming and avoided like the plague. It's an interesting story, and whereas this will be a long post, I don't believe in cutsand if you're the least bit interested in either copyright or SF, you should read it all. SFWA has no clear idea what its mission is. I belonged largely for their membership directory, and for occasional good writerly advice in the newsletter. Different people looked at it to be different things: Some were howling that it was the SF writers' union, which made me grimace. Some think of it as a professional advocacy/trade group. Others assume it should promote the reading of SF and fantasy among the general public. Some (few, including me) may still believe it exists to help writers become more skilled and more successful in the publishing world. I don't know. Once I founded Coriolis I had other things to do, and stopped paying attention. During much of the time that I belonged, SWFA seemed obsessed with tightening membership requirements. And I mean obsessed. A certain vocal contingent of insiders was hell-bent on making SFWA a sort of exclusive gentlemen's and gentlewomen's club. When I joined, you needed (if I recall correctly) one novel or two short stories in professional publications to qualify, and then you were in for life. What the clique endlessly argued for was a quantity-over-time requirement: You had to get a certain number of new stories into print over a period of time or your membership expired. For a number of years I listened to people basically talking about throwing me out, and after awhile, I just got tired of it and tuned out. I'm not sure if the scheme was ever implemented (today, three sales in approved venues gets you an active membership) but the discussion was offputting in the extreme. The database query run by SFWA against Scribd's files was mind-bogglingly stupid. As best I can tell from online reports, any file on Scribd that had the string "Asimov" or "Silverberg" anywhere in it was listed as infringing. Yeek. As you might imagine, the email demanded that Scribd take down a large number of files that were not owned by SFWA members, and were not even stories. Many were appreciations or bibliographies that were written to encourage the reading of SF. Aim at foot. Pull trigger. Repeat. Some handful of files that were listed in the takedown notice were placed there deliberately by their owners, who had released them under the Creative Commons license, and are used basically as downloadable demos to promote the printed editions of the electronic files. Cory Doctorow explains at length here how SFWA's idiotic request works against his own business model, which differs radically from that used in current SF publishing. To comply with Federal law, a DMCA takedown request has to be in a certain form and contain certain things. Whoever drafted the email had no idea what the law required, and people I trust indicate that the request did not comply with the law. Scribd, a site I had never heard of before, has received a fortune in free publicity. Sheesh, they could probably go public based on the traffic they're now getting. It may actually be a useful discovery tool. I'm investigating using them right now, for Carl and Jerry first, and for my SF later on. The blogosphere has carried the story to millions of current and potential SF readers, who now lump SFWA in with the RIAA and MPAA, the Big Media deathwish partnership that persists in suing small children, grandmothers, and people without computers for file-sharing. People who had not yet heard of SFWA's longstanding distaste for writers who post free content online have probably now heard of it, by reading the side-channels coming up with the main story and following their threads. Among SFWA's longstanding members and even officers are numerous credentialed flamers who feel that people who give their writing away make it harder for established writers to sell their stuff. (Google "technopeasant day" and sniff around. Lots to see.) Jerry Pournelle used to spend a lot of time railing against the Open Source movement for similar reasons. There's much to be talked about here, but that's not the point. SFWA has shown itself in opposition to a new business model that works for some (like Cory Doctorow) and may work for others as certain technologies mature. I have personal evidence that it works outside the SF world, from my experience posting free stories out of my Carl and Jerry reprint books. People find the free stories, download them, and then buy the books. I get emails regularly telling me that that is precisely what happens. We don't know how to make this work generally...yet. SFWA should be in the forefront of developing new business models, not digging in its heels at the rear. There's a trap here, and SFWA walked right into it: You can't enforce copyright by tossing grenades into a room that might contain infringers. The movie and music business are in the process of case-hardening public opinion against them, and by implication, the entire idea of copyright. Monkey-see, monkey-do. The people who genuinely do oppose copyright (and there are lots of them) are laughing out loud right now. Whether or not they had anything to do with this latest little debacle, they can nod their heads and say, "It's working." For those of us who live by copyright, that's mighty scary. Summer's over, which means I should probably begin my summer reading before they start putting up the Christmas decorations down at Safeway. I pulled an old friend off the shelf the other day: Ace Double H-85, and its lead half, Destination: Saturn, by David Grinnell (the pen name of Donald A. Wollheim) and Lin Carter. I still have the copy I bought in 1967, and because I immediately coated it with transparent Con*Tact adhesive plastic, the wonderfully droll Kelly Freas cover looks almost as good as new. The story holds up better than a lot of things I first read in high school, largely because it doesn't take itself too seriously. I call it lighthearted more than humorous, a word that now means "farcical" as often as not. 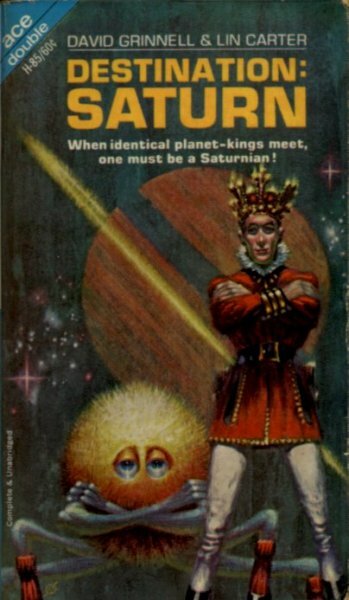 Pretentious and eccentric King Ajax Calkins rules an asteroid with his loyal fuzzball friend the Wuj, except that the asteroid isn't exactly an asteroid, and the Saturnians have eyes on it. So they create a fake King Ajax and attempt a coup. Lighthearted hard SF is an old and honorable tradition rooted in things like The Witches of Karres and Laumer's Retief, and carried on later by Alexei Panshin's Anthony Villiers stories (co-starring Torve the Trog) and the Warlock series by Christopher Stasheff. Destination: Saturn is great silly funand the first time I've read either half of an Ace Double in a number of years. Damn, that was good! Mostly, I think, because it's short, and an overstuffed life like mine doesn't always allow the time to read half a million words in a few days. I slapped the book on my scanner, OCRed a page, did a count, and then some math told me that the story is about 37,000 words long. This is a longish novella, a form mostly abandoned today because it's too long for the mags and too short for a book. On the other hand, it's long enough to develop a situation and some characters and have a little fun. And I can read it in an evening. Ace Doubles seemed unremarkable in my youth (they ceased appearing in 1973) because they were everywhere, but they are the only well-known modern example of books published in t�te-b�che format. This term refers to two books bound together, covers out, with one rotated 180° with respect to the other. Both books thus end at the center of the printed volume, and you have to turn the book upside down when you finish one and want to begin the other. Each book can have its own cover, though today I suspect people would argue about whose cover has to carry the barcode. ...t�te-b�che doesn't make much sense in an ebook. I suppose a printed edition could be t�te-b�che, and the ebook either sold as two items, or as a single file with one of the books starting in the middle. I'll keep thinking about it. The novella is a cool form, and people have done some wonderful things in it, most notably The (Widget), the (Wadget), and Boff, by Theodore Sturgeon, which I consider perhaps the best novella ever written. Ebooks are a natural for novellas, but they worked well in print for twenty years as Ace Doubles, and I wish they or something like them would return.